The Enso is simply a circle created in one brush stroke of a split second. The circle represents in its emptiness, absolute fullness, simplicity, completeness, endlessness, perfection of harmony. The painted sumi-ink circle, or Enso is a spiritual symbol of deep significance for many religious people, particularly Zen Buddhists. The circle, as we may know from most common understanding of the Zen tradition, is a representation of our true self. And it is painted / written in Chinese or Japanese calligraphy in a way that is not exactly mathematically perfect. The Enso is drawn by a human hand, with a brush, and is therefore perfect just as it is. Guided in the moment of the painter's state of mind - you can paint a powerful and well balanced Enso only if your mind is clear and free from thought or intentions. It's the true moment of emptiness within fullness. It's the reflection of your inner state of harmony. One significant feature of the Enso circle is that it is never a closed circle. There is always a slight opening somewhere indicating that it is not something contained in itself, but rather that it opens out to space, to infinity. It is a circle that embodies complete harmony. But Enso is also the symbol of the visible and the nonvisible, the symbol of Aikido, the jewel of all martial arts. Aikido is a non-violent, non-aggressive, non-competitive Japanese martial art that promotes a spirit of harmonious cooperation, personal development, and character refinement. Aikido was founded and developed by Morihei Ueshiba (1883-1969) in the early part of last century. O'Sensei (Great Teacher / Master), as he is called, was an extraordinary swordsman and Jujitsu specialist who gained a reputation of being virtually unbeatable. Despite this achievement, he was profoundly troubled with a conflict between his martial skills and his spiritual training. He felt strongly that winning at someone else's expense was not really winning, and that his most formidable opponent was himself - ! 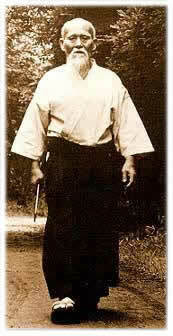 The birth of Aikido resulted from his long and profound search to resolve this conflict in his life. O'Sensei concluded that the basic principles of the universe are harmony and love and that these can be attained through the martial arts. Hence, he combined his vast martial experience with this new insight to form Aikido; a new martial art based not on violence and destruction but on loving, comprehensive protection of all life. Aikido is the martial art of the modern day. Aikido does not cultivate a fighting spirit, but looks to find harmonious resolutions to conflict and aggression. Therefore, we from Discovery Internet have experienced since more than 4 decades, that the spirit of Aikido is the basis for innovative, intelligent and adaptive marketing and advertising strategies. The philosophy of Aikido teaches: " Water is always flowing to deeper places ", i.e. to learn "go with the flow". The dinosaurs were not able to adapt to the development of change, therefore they became extinct. as most marketing experts think by comparing the "opponents" products, whose product might be the better one. Unfortunately they think, what has to be done, that the consumer will like my product too. We have practise marketing always in the spirit of the Art of Aikido, there should never be "me too products" - , that means, forget the weapons, i.e. Forget the brand - think CATEGORY ! far less the approach of " keep trying harder ". There are never "best products" in this planet and there is never objective reality among customers and consumers mind. All that really exists in marketing are perceptions instilled in the minds of customer's prospects and behavior. We must accept that truth and perception become fused in the consumer's mind, leaving finally no difference between the two, even less between the hundreds of other products... in fact "Marketing-Reality" summarized, is perception only. Certainly based on experienced market and product research, as well as consumer analysis and nothing else. All research is worth nothing if it does not lead to these discoveries of comprehensive "category thinking" i.e. the knowledge of marketing wisdom - .
" Less is always more "